Pine tree wreaths are fresh, festive and inviting when hung on a door or wall around the holidays. While pine tree wreaths are available for purchase in any craft store or online at any time of the year, pre-made wreaths are often made with synthetic pine branches and don't have the same scent. They can also run on the expensive side. 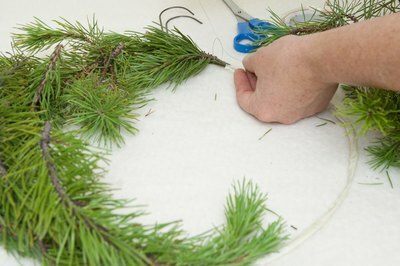 Making your own pine tree wreath is easier than it sounds and inexpensive. 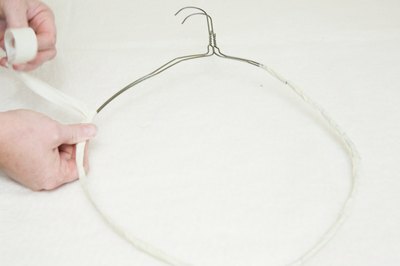 Stretch out the bottoms of two wire hangers so each forms a big circle with a hook on top. Secure them one over the other with floral tape, so they make a single wreath frame. 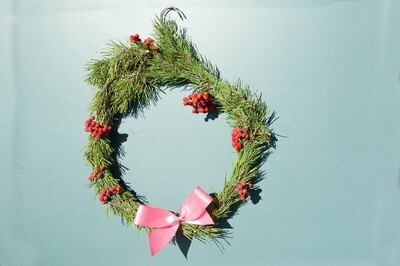 Lay sprigs of pine tree branches over the wreath frame with the branches overlapping and pointing in the same direction. Use floral wire to bind each branch to the frame. 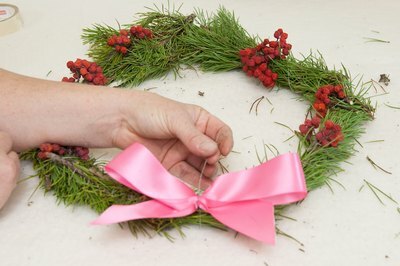 Wrap a piece of the wire around both the sprig and the frame and twist the two ends together in the back of the wreath. Some sprigs may require more than one piece of wire to hold it down securely. Run a length of floral wire through the center of a large bow made of ribbon. Center the bow at either the top or bottom of the circle, as looks best to you, and secure the bow to the wreath with the wire.